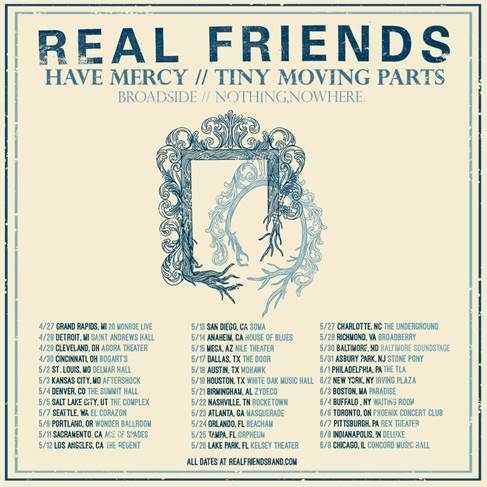 BROADSIDE have announced their first US tour of 2017, alongside Real Friends, Have Mercy, Tiny Moving Parts and Nothing, Nowhere. Playing tracks from their upcoming album, BROADSIDE’s impassioned delivery of melodic pop-punk anthems will propel them into the big leagues in 2017. The tour begins April 27th in Grand Rapids, MI, and hits all four corners of the States before concluding in Chicago on June 9th. BROADSIDE previously announced their initial 2017 tour plans, which brings them to the UK for the first time, supporting With Confidence. Stay tuned for more album info and tour plans as BROADSIDE is ready to takeover 2017.